Large Jade Koru Sculpture BY Bill Goodwin, Authentic New Zealand art, FANTASTIC! A Very Fine hand crafted Jade Koru Sculpture by Bill Goodwin. This is a stunning fine sculpture, fine art in the truest sense, highest quality materials and craftsmanship. Hand made in New Zealand by an important master carver in the way of a millenary tradition. Large Jade Koru Sculpture UNIQUE PIECE! 135 mm Long (5.3 Inches). 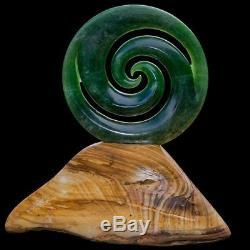 A large double Koru sculpture carved in New Zealand flower jade or Pounamu and mounted on a petrified native Kauri wood base by master carver Bill Goodwin. This stunning Fine Art piece represents the Koru which is the fern leaf as it opens bringing new life to the world. It speaks of new journeys, family and love. Check out for other works from New Zealand craftsmen in our catalog. Please refer to pictures and judge by yourself, if you have any questions just ask and we'll be very happy to assist you. By subscribing to our Newsletter you will receive the latest info about our incomparable auctions, preference bonus and more benefits! So please visit our store now and see why we represent a magnificent choice when it comes to FineOnline Auctions. The item "Large Jade Koru Sculpture BY Bill Goodwin, Authentic New Zealand art, FANTASTIC" is in sale since Friday, December 15, 2017. This item is in the category "Collectibles\Cultures & Ethnicities\Australian". The seller is "thecollectionexperts" and is located in Manukau. This item can be shipped worldwide.